Backpacking is a great experience, and for those of you who enjoy spending time in the great outdoors, what better way to do so than with your dog. Backpacking can be a challenging and rewarding experience, for both of you; dogs enjoy carrying packs, and providing you start training correctly, this is a fun activity that can be done time and time again! Dogs from about 9 months can start to wear an empty pack and begin to get used to wearing it. It can be quite strange for your dog to have this unknown object on its back; let him walk around with the pack on; go for short walks, whilst he adjusts to the wider load – he will bang into things at first! When your dog reaches 12 months of age, you can start to add a bit of weight. Use something that is light, but bulky, and ensure that you equally balance both sides of the pack. Keep sharp objects away from the inside of the pack so they do not dig into your dogs sides; softer items such as clothes or towels are good to pad and protect the dog. Slowly you can add weight to the pack; do not increase it substantially – ensure that you increase slowly and allow the dog to adjust to the additional weight. It is important that the backpack fits correctly, and is not too large or small. Place the pack and weight which your dog will carry, over the shoulder blade (withers) area, and not in the middle of the back. The shoulders are built to carry the weight; the spine is not. A fit and healthy dog that had the correct introduction to backpacking should be able to carry up to 30% of his own bodyweight. You should be able to remove the backpack quickly in case of emergency or even when you stop for a rest or water, so check that it has quick release buckles. 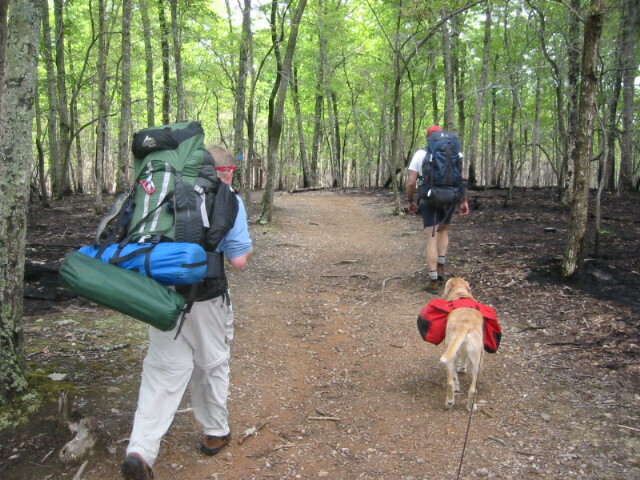 Before you do any backpacking with your dog, you need to ensure that both you and your dog are fit enough. You will need to train for longer distances (if this is your goal). Regular walks, without a backpack, of increasing distance and varied terrain should be a regular part of your training beforehand. You need to be sure of your dogs obedience; will he walk to heel when asked? You do not want to be pulled downhill when your dog has spotted something he’d like to chase! You should walk with your dog on a lead whilst he wearing his backpack – and also, obviously, on a lead around livestock and developed areas where there are risks to the dog, such as traffic. Your dog’s feet need to be conditioned for backpacking walks as you will be covering a variety of surfaces. Your first few outings should be kept simple and a positive experience. You can build up the distances gradually and then move onto some walks with hill climbs and descents. A suitable walk will include lots of places to stop with water, such as rivers and streams. Plan ahead for your walk, and ensure that you are aware what terrain you are travelling over. If you are backpacking in the summer months or hot weather, try to find walks in the shade, and perhaps set off earlier when it is cooler. Know when to turn around and head back if your dog is too hot and struggling. Items that you will take on your walks will change, but ensure you always have fresh drinking water and a bowl for your dog, and fresh drinking water for yourself. The dogs water and bowl should be easily accessible within the backpack. Take as many water stops as you’d like and need – watch for your dog to ensure he is coping well and not becoming dehydrated or panting too much. You should take food rations for your dog, as well as yourselves – don’t forget, he is working as hard as you are! If you are out by yourself, it is advisable to always tell somebody where you are going and what time you would expect to return. Take a mobile, compass, map and water with you at all times. Remember to follow the Country Code. Do not drop litter, take all of your rubbish with you and always clean up after your dog. Keep to footpaths and ensure you always close gates. Most importantly, you should ensure that both you and the dog have a fun and enjoyable experience! Now…go pack up and get out walking!